Note, if the photos are small, try hitting F5 at the top of your keyboard. Above, Gary’s Piet at its first public display. I have seen a lot of detailed photos of the plane, and the fine points are just as good as the big picture above. Above, Gary stands with the plane in a rear quarter view. Below is a letter Gary sent out to friends when the plane was done. His letter contained a fuzzy photo of the first Pietenpol he had ever seen, 40 years earlier. His note starts with remembering that day when he was 19 years old…….. I was 19 years old…and hung-over for the first time (its own bittersweet story!). 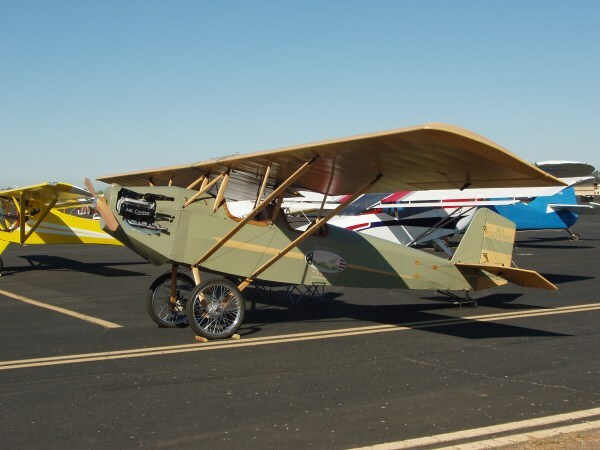 Bad as my headache was, I wasn’t in such poor shape that I couldn’t recognize the simple beauty of a Pietenpol, telling myself, “Someday…” For those who may not know, this airplane was designed by Bernard Pietenpol in 1927. It has always only existed as a set of plans, by which aviation experimenters have been building Pietenpols around the world for the past 80+ years. Moving words indeed. There are plenty of people in this world who don’t have the same ‘dream’ if they don’t get it in 40 minutes, far less 40 years. The golden rule of homebuilding: persistance Pays. If your reading this and have spent a few decades unable to shake the feeling that you need to build a plane, perhaps Gary’s example may be the best path to follow. everything he has said about the experience since the plane was completed says the dream was well worth the treasure and toil. Over the years, I have spent a number of hours hanging out with Gary. Simply put, he is good company. He has an easy-going demeanor, and the things he says are well thought out and insightful. In a world where ever more people are personally distracted, a guy like Gary who is focused and alert enough in conversation to really stick out in a day of speaking with 200 people, is unique. Over the years I have shared a lot of different aviation stories, some mainstream that many people liked, some speaking of an experience or a subject that was well off the common path, such as working in the shop in the middle of the night and thinking about long dead friends. Subjects like that make most people uncomfortable, and the stories don’t often generate return mail. In years past Gary is one of the very few people to write in to say that he found the stories thought-provoking. Like most people, I didn’t take enough time when I was younger to really thank the people who taught me the things I know about planes. Gary is the opposite of this, he is really good about letting people know that their assistance was much appreciated. He is an all around class act. On the subject of “why choose a Corvair?”, a few thoughts; Below is a photo of Gary’s first engine run at CC#18 in 2010. 95% of people getting into experimental aviation today don’t really care to know much about the engine that will power their plane, they will be perfectly happy to have some type of appliance with a “no user serviceable parts inside” sticker on it. This isn’t a very rewarding approach, but I can also make a good case that it isn’t a safe attitude either. In aviation, ignorance isn’t bliss, at least not in the long run. In 25 years in aviation I have seen a lot of things, but I have never seen a single person ever get hurt because the knew too much about the care and operation of their machine. Gary, and builders like him are the polar opposite of people who enter aviation with the misguided and naive belief that you can somehow spend your way to safety, like it was some product that you can purchase by the pound. Lots of potential Pietenpol builders pick an A-65 Continental because they want a ‘reliable engine.’ The last time these engines were new was 65 years ago. Very few of the ones offered for sale are in airworthy condition, even if they are advertised as ‘reciently overhauled.’ Most of them are built back up out of people’s junk parts piles. It is very common to find Standard pistons in overbored cylinders, cranks turned .030 under, and wasted valve trains. Any person who thinks that a 65 Continental in the flymart is more reliable than a Corvair that is carefully built of new parts is delusional. Airworthyness isn’t in the old battered data plate, it is in the carefully assembled quality components. The second factor on engine choice is support. A person picking the Continental may have some buddies,local ‘experts’ and on-line friends to advise him, but none of these people are in the profession of installing engines in experimental aircraft. Conversely, if a builder like Gary selects the Corvair as his power plant, we will directly support him. I offer every part to mount the engine on his plane, I know the W&B issues, and I make it my business to teach every detail of the Corvairs care and operation. Over time, I answered all of Gary’s questions, covered details on tuning his carb, and highly encouraged him to get a test pilot. Gary directly credited the success of his project to factors like these. And lets not forget the big one: They don’t have events called “Continental Colleges.” No one from TCM or any other engine supplier hold free Colleges where builders can build and run their engines under expert supervision. I have done things like the Weight and Balance project that support all Piet builders, no mater what engine they have chosen. There are valid reasons why an individual might want an engine other than a Corvair for their Piet, that’s personal choice. However I do take a dim view of any suggestion that we don’t support builders, and a very dim view of the one or two ‘internet personalites’ who continuously criticise anything to do with Corvairs. In light of our service to Piet builders of all types and direct support of Corvair/Pietenpol builders, internet critics of all things Corvair reveal themselves to be vermin without anything to contribute but hollow criticism of others. 2 Responses to New Pietenpol, Gary Boothe, Cool, Calif.
Identifying with Gary in his around the patch vid, I imagined I would feel that first 5 minutes as a lifetime in microcosm. When I first went up in a venerable old Howard to make my first jump, waiting was one lifetime. When my turn came to kick my leg out into the slipstream and stand on the step, holding on to the nearest strut until I got the thumbs up, that was one lifetime. When I committed and pushed off into an arch and began counting, that really was a lifetime. Now I look forward to one parallel to Gary’s. In reference to your second message about your invaluable support: A fella on the Zenith builder’s forum with a Corvair powered 601 asked if anyone had successfully hooked up their tach sensor to a Dynon. I answered I had no experience, but that you had covered it in this forum and were a phone call away, happy to answer and help him with the tested, reliable method. I reminded him, why ask someone who’s only built one aircraft, or even 2, if he could simply ask you for the proven answer? Hopefully you’ll hear from him. 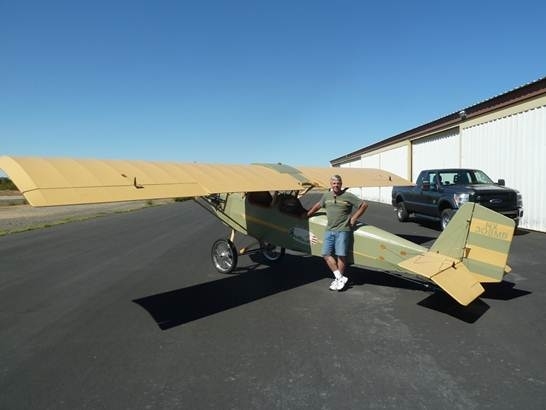 very cool aircraft Gary, the Piet would have been my first choice to build, but ny6’1″ frame and 225 pounds pushed me to the zenith. My first choice of engine has always been the Corvair and am not disappointed. Best support ever and have a lot of new friends.